THIS is not a review, because it was a holiday, vacation, call it what you will, but the reporter's hat was handed in, the journalist's quill was set aside at the airport, and the notepad buried deep in the bottom of the backpack, but it would be remiss not to give a mention to HRH Ibiza Road Trip here. It was such a unique experience the scream went up "why have we not done this before? ", and "Can we afford next year". Of course, Ibiza is known as the destination for ravers, clubbers as they head off in drug addled states to listen to trance, electronic dance music, or whatever else shite they find entertaining. 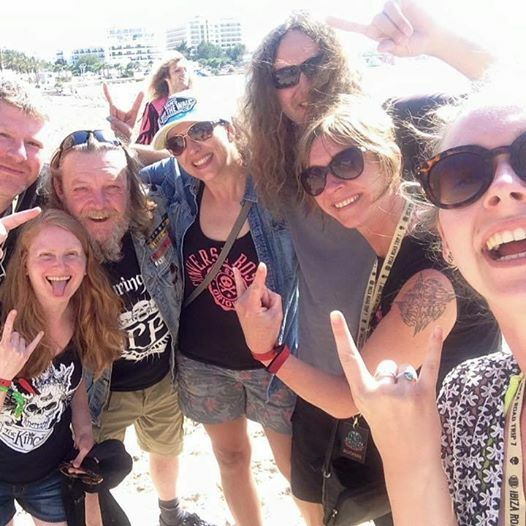 But for one week the island's city of San Antonio sees several hundred rockers and metallers descend upon its bars and restaurants before heading off to see bands of a dizzying variety. It is fair to say that after airport rules were applied (no matter the hour you are allowed pints) our contingent from Northern Ireland arrived refreshed [Editor's note: thirstier than they started}, we checked in, met our HRH rep, Harri and ventured forth. Now in the sunshine as you walk past a bar which proclaims from two signs that pints of San Miguel cost a whopping Two Euros and Fifty Cents. As Meat Loaf's antagonist said: "Stop Right There!" So quaffing began, and in the surreal world of the HRH Ibiza Road Trip you end up sharing a pint with Evil Scarecrowdrummer, Jordan (you owe me a pint, sir). Now, owing to the continual flow of cheap pints of the Wednesday night we can recall Trucker Diablo'sset (excellent as always!) before taking a taxi back to the hotel. Thursday it emerged that rockers and metallers can survive in the sunshine...yes sunbeds occupied by long haired, tattooed types smearing sun cream over each other. One of the features of the Ibiza Road trip is the band's are staying at the same hotel as the fans. We were fortunate to have RSJ, Diamond Head, Stoneghost and Tygers of Pan Tangat our hotel, and all were happy to mingle, chat and exchange road stories. And, why were we going to the docks? Of course, for a boat ride to the other side of the bay. Nobody was drowned...an achievement in itself. Return journey could be achieved for a modest fee in a taxi, or await the HRH laid on bus back. There were bands aplenty, with each night themed as AOR, NWOBHM, Metal etc. It would be unfair to list any as top acts, but Diamond Head, Bonafide, Vardis and RSJ shone bright. The venue for these shows was, it has to be said neither disability friendly, nor really rock friendly either, but that didn't stop the fun. Swimming pools, a rockin' foam party - yes rockers almost drowned in a sea of foam that topped even the tallest - four acoustic sets and then into the main venue. Pontius Snibb's Blues Band performed a quite extraordinary set of jaw dropping excellence. Topping the night off was laughter and singalong. Hayseed Dixie. Plain good fun, delivered with an intelligent set played with a knowing wink of the eye. On the return journey we all sang the songs, but videos posted since show that singing was a loose term for what was performed. A special mention must go to Fleur, Terri, Jonni and Harri for keeping us all safe and emphasising that we were there to enjoy the hell out of our selves.